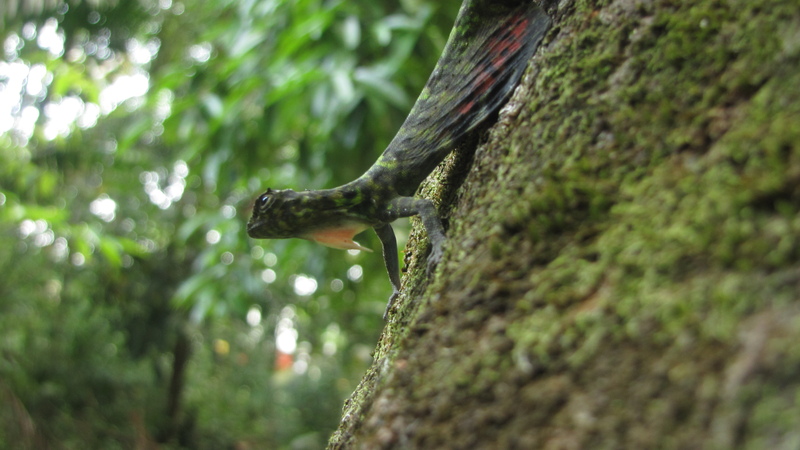 A recent study in Oecologica by Terry Ord and myself found striking parallels in habitat use and morphology between the phylogenetically distinct Anolis and Draco genera. Draco (family: Agamidae), for those who don’t know, is a genus of gliding lizards found throughout southeast Asia that are similar to anoles in that they communicate with conspecifics using bright and diversely coloured dewlaps (see picture). 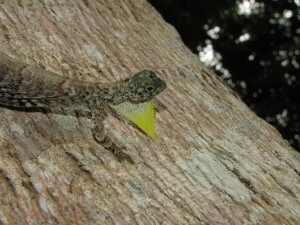 A defining characteristics of anole ecology is their ecomorphology – a description of the species microhabitat and its morphological adaptions for thriving there. Anole species living sympatrically avoid interspecific competition by partitioning their habitats and resources, and consequently develop morphological adaptations that are suited to their slice of the habitat. As Draco species are also often found in sympatry, we tested whether competition pressures had resulted in similar habitat partitioning and corresponding morphological characters (or ecomorphs). 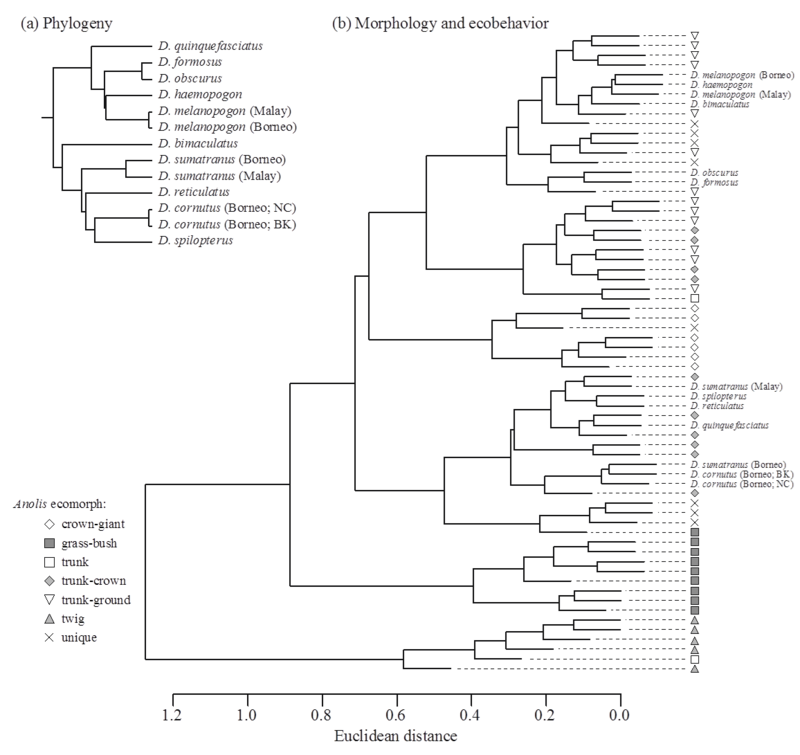 Whilst it’s perhaps a bit early to suggest that Draco have evolved the full complement of anole ecomorph classes, the Draco taxa studied largely clustered into two groups that shared characteristics with the Greater Antillean anoles. The figure below (panel b) shows a combined Draco/anole phenogram, based on morphology and ecobehaviour (the anoles are labelled only by ecomorph). The Draco species fall out largely in line with groups of ‘trunk-ground’ anoles towards the top of the phenogram, and ‘trunk-crown’ anole towards the bottom. One of the better diagnostic features of the Greater Antillean anole ecomorphs are the differences in perch use and subsequent differences in limb length. The plot below shows total hindlimb length (size-free residuals) of adult males of Draco species and Greater Antillean anoles, as a function of perch circumference. 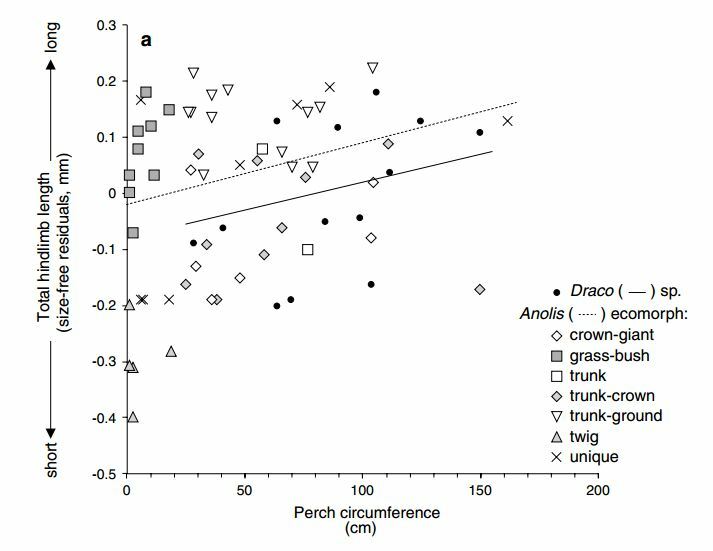 The relationship between limb length and perch size is nearly identical between the groups, with a very similar slope, and only a difference in y-intercept owing to differences in body length (Draco bodies are elongated to accommodate gliding membranes). The same unit increase in perch size results in the same unit increase in limb length for both genera. 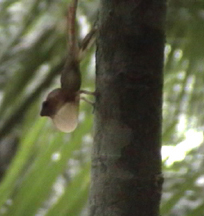 These results are surprising considering that this relationship has not been found in species that are more closely related to the Greater Antillean Anolis (see study for references) and because Draco and Anolis have very different ‘key innovations’ for locomotion in their respective habitats (toe pads for Anolis and gliding membranes forDraco). This implies that Draco species have experienced interspecific competition over resources in similar ways to the anoles, resulting in homologous character displacement.